Dan's Adventures in Fiction: Hopping Mad? 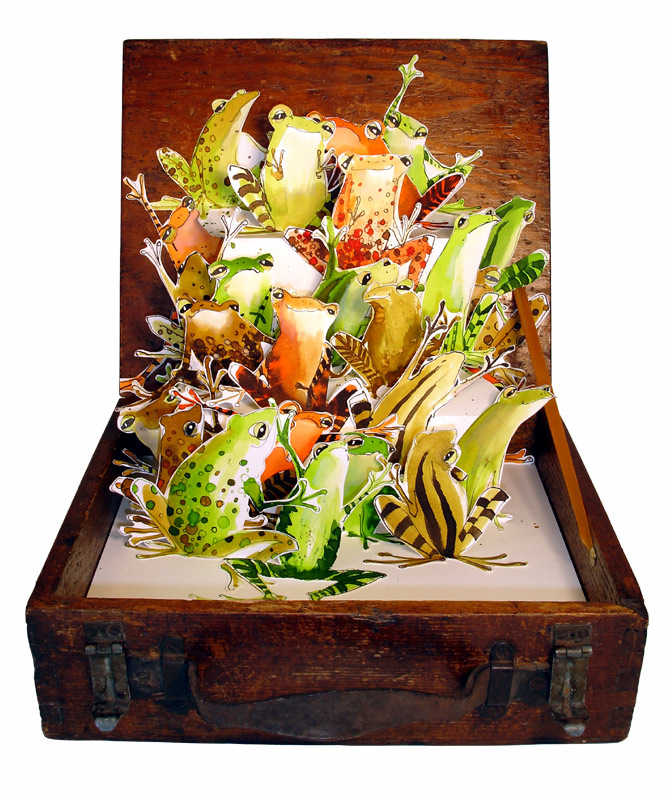 "Mad as a Box of Frogs" by Becky Brown. Used here by kind permission of the artist . Twitter and Facebook were ablaze earlier this week with the unfolding (or should that be 'unravelling'?) story of a writer who had taken exception to some (to be honest, rather mild) criticism about a book he had created with iBooks Author. The full exchange can be read HERE. Be warned, you might need a large pot of coffee if you hope to get through it all in one go. If you have better things to do than trawl through all that, suffice to say it's another example of a writer launching what I'm sure he believes is an entirely justified defence of his work, standing up for his artistic integrity, etc, etc. He asserts that the reviewer is factually wrong to, for instance, call his prose "workmanlike", and goes on (in an extraordinary series of twenty-three comments, posted over ten hours (and that's just the start!)) to post extracts from his work, saying some of his descriptions are worthy of Keats or F Scott Fitzgerald. As far as he's concerned, he's doing the critic a favour, by highlighting examples of his writing that prove the review is incorrect. The problem is, writers don't get to do that. When somebody reads something we've published, their response to it is entirely outside our control. If they think the prose is workmanlike, or the plot is unoriginal, or the characters are unconvincing, then our only option is to take it on the chin. It's only one person's opinion, after all. If several people say the same thing, that probably highlights a weak spot that would be worth concentrating on when it comes to the next book, story, or poem. What we don't get to do is fly off the handle, accusing the reviewer of telling lies or being ignorant. Because that will only ever make you look like a complete nutcase. I think the only case when it might be appropriate to response to a review is when there has been a genuine factual error - for instance if they've misspelled your name, or got the book title, ISBN, or release date wrong. Anything else, you just have to let go. And even if there is something justifiable, then a discreet email to the reviewer or editor of the publication in question is a far better option than waging all-out war in the comments thread. Personally, I'm going to keep hold of the link to this particular example of a writer in meltdown. If, in the future, I find myself published and on the receiving end of what I consider to be an uncharitable review, and I feel my fingers creeping towards the keyboard to unleash the kind of righteous indignation that only a writer can muster, I will stop, read the entire "Venice Under Glass" thread from start to finish, and then see if I can summon up the will to tear into the reviewer in the same way. Chances are, I won't. And that can only be a good thing. In one of the happy accidents that the internet often throws my way, while I was looking for a picture to illustrate this post I chanced across the work of Becky Brown. Her animal illustrations are fantastic - full of life and personality. If you like them as much as I do, please go and take a look at the wonderful prints and cards for sale in Becky's shop. It really is one of the most toe-curlingly funny reads ever. Yes, this is a lesson to us all. Wow, that is truly excruciating and excruciatingly funny. It absolutely blows my mind that there are authors out there like this. You're so right - we can't come back to the comment "the book is boring" with "no it isn't". It bored that reader even if it didn't bore others! When you join the Goodreads author program one of their primary top tips is just "don't respond to reviews". Wise words. All this poor man has done is ensured he'll pretty much never be taken seriously as a writer ever again. And posting all those extracts as a mark of his genius? I'm afraid they only served as ilustrations of the review! I've yet to read that, but as I've learnt in a different context with trolls ignoring them is by far the best way to preserve your sanity. So, you work hard on a book. You believe in it. You take heart and put it out there and a reviewer cuts it down. Ok, perhaps the best advice is not to respond to the review… but surely, as fellow writers, we should be sympathetic when someone has made the error of responding? We understand the pain of having our 'children' publicly ridiculed and so we should be more careful in our support of the writer - not finding it all so funny, but feeling that writer's pain and offering understanding and soft words. All writers need grace and dignity, then they bear (see what I did there? )their pain with a calm, sad smile and don't make a complete prat of themselves, berating their critics. Total nonsense… what all writers need! According to you perhaps, as if there is a recipe for 'the successful writer'! We do what we do and we lay ourselves open. If we sell then that's something and if we don't then that's something else. We don't need to be cutting each other up because we haven't got grace and dignity. Literature is supposed to broaden the sympathies of the reader… and surely the writer, too. Where's the love dear friend? Sorry - I've been away for the weekend and have only just had a chance to respond. Thanks to everybody for taking the time to comment. I can't tell whether or not you've read the thread, Anon, as there are many comments on there from people who are sympathetic, who've extended the hand of friendship and advised the author to back away, who've reminded him that the review is only one person's opinion. Some have even gone to the the effort of trying to explain why some of the extracts he's posted could be described as needing more work. But his response to each and every one of those has been the equivalent of covering his ears with his hands and shouting, "La la la la la, I'm not listening." I think the situation would be entirely different if the reviewer had, as you say, 'cut down' or 'ridiculed' the book, but that's not the case. The review is broadly positive in tone, although the book's obviously not the critic's cup of tea. There's no attempt to humiliate the writer or rubbish his efforts, so his spirited defence of his work is as perplexing as it is, ultimately, amusing. But I think some of the smiles it's generating are ones of recognition. We've all been there - once you're sending your work out into the world it's only a matter of time before somebody says or writes something in response that doesn't match our expectations. A rookie writer will take it personally, and try to argue or justify their way away from the criticism. It's one of the reasons it's so helpful to belong to a writing circle or an online critique group. That way you get used to the slings and arrows of criticism in a relatively small, closed (or at least, less public) environment. It's an important lesson, and worth learning as early in your writing career as possible: You can't talk somebody into liking a piece of writing. So there's no point trying. All that stuff was half a book's worth! Hopping MAD, you say, Dan Purdue. And that box picture: MAD as a box of frogs I think it means. Sorry, but that seems to me to be a kind of humilation aimed at the writer. I am not speaking against those who have shown sympathy. I guess I am really speaking against this whole internet thing, where people cut each other down with no real knowledge of the person they are attacking or what that person might be feeling. I sometimes have to deal with people who cannot function as ably as others, or people who do things 'wrong' because they do things differently, (people who do sometimes stick their fingers in their ears and sing lalala) and being involved with people like that teaches you to be less judgemental. I guess I am saying something along the lines of 'let him who is without sin cast the first stone' which in essence is to say there should be no stone throwing… that's all. You've chosen to interpret my post as a personal attack on somebody I don't know, and that's something you're perfectly entitled to do, Anonymous. It wasn't meant that way (and if it genuinely reads that way I apologise). It's not stone-throwing or name-calling. Mad can mean angry, too - in fact that's usually what "hopping mad" tends to refer to, and it's certainly the case here. Being a writer yourself I'm sure you appreciate that one of the joys of working with language is the way words can have more than one meaning. If it's an attack on anything, this post is aimed at the guy's actions, not him personally. It's intended to let what happened on the review I've linked to serve as a cautionary tale, a reminder to writers not to let themselves get "hopping mad" - so enraged by a stranger's response to their work that they compound the problem by responding, over and over again, trying to convince them they are wrong. Ultimately, such actions do no good at all, because people are judgemental and will, rightly or wrongly, make their conclusions about you based on their perception of how you've behaved. And I strongly believe that's something that, regardless of any personal issues, anybody trying to make money from their writing should fully understand. Dan, I fully appreciate what you were trying to do here. Honestly, I do. And, yes, I know that hopping mad usually means angry. But the box of frogs… that's madness in another sense. Maybe I over stated the case. I just hate to see people being attacked when not much is really known about the person. And people jumping on the bandwagon and the gentlest criticism transformed into something personal: 'prat'! And all under the seemingly sane guise of 'what a writer needs to be' when there are no such nonsense absolutes. I threw my hat in here for the sake of balance. It's just too easy to be critical and harsh and the internet seems to foster that. I think people - all people - deserve better. I'll always try to give people the benefit of the doubt, and if I believed for a moment the guy genuinely had any problems of the type you're hinting at, Anonymous, I would never have written this post. But from the thread it's clear he's enjoying his moment in the spotlight and believes the fact he has produced a book gives him agency to hurl all sorts of abuse at people. Balance is good, certainly, but let's consider the facts. Harper was lucky enough to have his book reviewed in a long-running and seemingly well-respected online publication. No one's entitled to that purely by virtue of having cobbled together a book. The reviewer went to great lengths to present an remarkably even-handed review of the work. Again, Harper was fortunate - on the face of it his book sounds faintly ridiculous, so I'm not convinced many other professional critics would have been so generous. Up to this point, Harper's been treated as though he, too, is a professional. It's his response that convinces (almost) everybody else he is no such thing. He attacks the reviewer, in an increasingly unkind and personal way. He calls him unprofessional, ignorant, claims his review is deliberately misleading, repeatedly accuses him of not actually reading the book, and (as noted in the closing post by the editor) eventually resorts to posting details about the reviewer and his personal life). When other people join the discussion, Harper berates them too, calling them trolls and idiots and liars, saying they are "uneducated", "dishonest" and "just plain stupid". I'm all for balance, but what Harper has done on the review thread is totally unacceptable. I am sympathetic to the point that I can understand how somebody can be hurt and upset by criticism, but that sympathy does not last long once that person starts flinging around abuse and insults. People are free to express their opinions and, while the internet can produce some pretty unedifying exchanges, I think the comments here have been extremely mild and restrained given the evidence presented on the review thread. 'On the face of it' - there's a judgement that sits on flimsy foundations. And as for professionalism? Just because force of numbers convinces you, is no reason to be adding to the criticism. Hw professional is that? All I am saying, Dan, is that there is no virtue in adding sixpence worth to something about which we are not fully educated. And some of the people commenting here on your thread have fairly strong comments which I feel sit on unsure foundations. Best left alone, I think. You could have made the points in this post without bringing in this person's story. And I still object to your box of frogs which continues to say to me that you are calling this person mad in the sense of questioning his mental stability. And I do not think you are qualified to do this, and nor do I think this is a kind thing to do to anyone. Chimes pretty well with what I am trying to say. I appreciate your kind words regarding my blog posts. Part of me would like to respond to all your other points and carry on this discussion, which I am genuinely finding interesting, while another part is convinced we're now going around in circles and to do so would be to artificially prolong a debate that has already exceeded its natural shelf-life. I would, however, like to respond more fully to your point about the box of frogs metaphor. I resent being told what I was thinking when I chose it, although I acknowledge that people coming to this with a certain viewpoint may find it offensive or objectionable. I also realise that words like "nutcase" in the original post can upset people too, but in context I hope it's clear that I'm referring to a type of behaviour and that it's not an accusation directed at anybody in particular. The reason I think the box of frogs is so apt is because it's an excellent metaphor for the situation, not the person. Imagine an actual box full of actual frogs, scrambling over one another, leaping and fighting for position and sliding about all over the place. It's an undignified, bewildering mess. How else would you describe the comments section on the Tidbits article? The other thing about a box of frogs is that once the lid's off, sooner or later the frogs are going to get out. They'll go bouncing off in every direction and you'll have no control over where they end up. This is exactly what's happened with this Tidbits article - it's popped up in a French newspaper, it's in The Guardian, on forum websites like Reddit and Absolute Write, and it's been mentioned on dozens of blogs. Harper's frogs are well and truly out and there's no way they're ever going back in that box. This is precisely my point - a little humility can save an awful lot of bother. The saga we're talking about is a perfect illustration of the importance of humility and the damage a lack of it can do. You're as mad as a box of frogs. As for cherry-picking the thing on humility… it's not really about exhorting others to be humble but an exhortation to embrace humility in oneself. "I have always been mystified by the speed with which people condemn one another. Feeling as righteous as Christ chastising the money-changers in the temple, they cast their fellows into the outer darkness of their disapproval. This seems to give them intense pleasure. Whenever I am tempted by this pleasure, I remember some impulse in myself that could have led me, granted certain circumstances, into the condemned position. This has caused me to distrust the part of myself that would relish self-righteousness." And if we exemplify this in what we say and do, then we can be a little surer of doing good in the world or at least of doing less harm. PS * You can't just change the meaning of a well-used and well-understood simile in your head. It means what it means. Yippee!Finally I got your writing that I loved the most. Hey, can you please tell me about everest double glazing prices?